Rihanna is a known face when it comes to beauty. The Hawaiian beauty runs her own fashion and beauty line apart from a singing career. That is enough to state how serious she is about her beauty line. 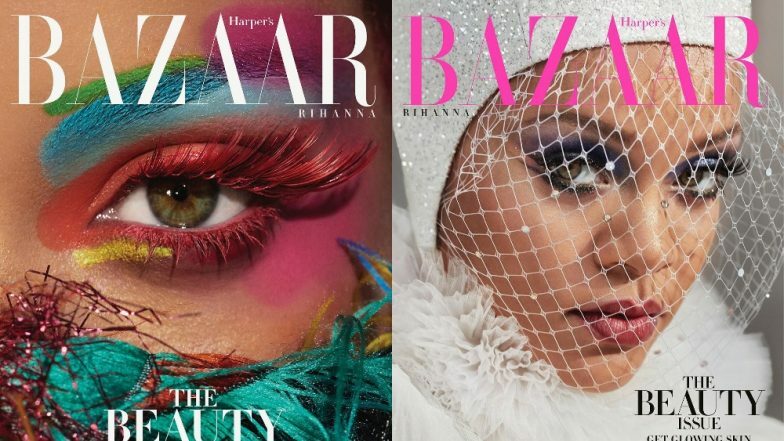 At the cover of Harper's Bazaar magazine for their May issue, the diva got a closeup shot at her face with some bold makeup. With rainbow eyeshadows and metallic green lips, Riri totally rocks the cover! In another image shared by Rihanna, she is seen wearing impeccable makeup with special emphasis to her eyes. Covering her head with a glittery cap, the diva wore a netted veil. While on the cover, she wore two different looks, for the inside pictures, the diva chose to wear a gorgeous tousled Givenchy ensemble. In another picture from the shoot, she is seen posing alongside various sculpts. Needless to say, Rihanna looked breathtaking in all the pictures shared by Harper's Bazaar! Check them out below.